Many are unfamiliar with MGD and are not aware that it is a leading cause of dry eye disease. A patient undergoing checks for MGD. A new survey conducted by Johnson & Johnson Vision has revealed that seven in 10 Singaporeans regularly suffer from symptoms of Meibomiam Gland Dysfunction or MGD, a leading cause for dry eye disease. However, close to nine in 10 Singaporeans (86 percent) are unfamiliar with MGD, and a majority (76 percent) choose not to seek professional help. Can you explain in simple terms what MGD is and why oil glands do not function properly? MGD is the blockage and non-functioning of the oil glands that are called meibomian glands in the eyelids. The oil secreted by the meibomian glands are necessary for protecting the tears from pathogens, allergens and evaporation. Without proper functioning meibomian glands, patients may face eye discomfort, inflammation, fluctuating vision and be at risk for developing dry eye. MGD is a leading cause of dry eye disease. There are more than 340 million people globally affected by dry eye disease. What are the symptoms of MGD? Symptoms include: Dryness, grittiness (the feeling of dust in your eye), watering, irritation, stinging or burning, and blurred or fluctuating vision. Why is this not a very known condition? MGD is highly prevalent in Asian countries, reporting an incidence rate of between 46 percent to 70 percent. The high prevalence rate of MGD is a cause for concern, considering that it is the leading cause of dry eye disease. As said earlier, there are more than 340 million people around the world suffering from dry eye disease. However, many cases go undetected because of the lack of awareness around MGD and what its symptoms are. A recent survey conducted by Johnson & Johnson Vision found that close to nine in 10 Singaporeans (86 percent) are unfamiliar with MGD. This despite seven in 10 Singaporeans regularly suffering from symptoms of MGD mentioned above. MGD symptoms can easily be brushed off as minor discomforts. However, they could be an indicator of something more severe. Therefore, we want to create awareness about MGD and encourage Singaporeans to do more to protect their eyes. What is the prevalence of those over 50 who have this eye condition in Singapore? Why is that so? Studies have found a higher prevalence of MGD in Asian populations above the age of 40 years old. Age-related and other systemic factors or processes like menopause may influence the structure and/or function of the meibomian gland. 60 percent of contact lens wearers. For individuals who do suspect that they might have MGD, however, I would recommend seeking the advice of their eye care professional. He or she would be best placed to provide an accurate diagnosis and treatment if needed. There are other lifestyle and environmental factors that can contribute to MGD. Can you tell me more? It has been found that long-term exposure to air-conditioned environments as well as prolonged screen time can contribute to MGD. According to the survey by Johnson & Johnson Vision, nearly half (49 percent) of MGD symptom sufferers reported experiencing their symptoms at work. An additional 51 percent also reported experiencing symptoms after prolonged exposure to digital screens, while 30 percent also experience symptoms with over nine hours of aircon exposure. How can people find out if they have this condition? 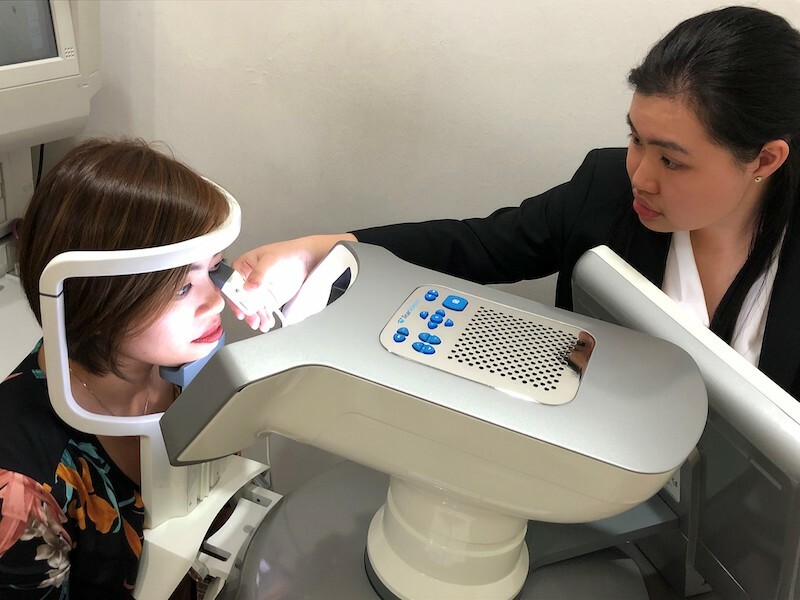 I would encourage all Singaporeans with symptoms to get their eyes checked for MGD – especially patients who are about to undergo eye surgeries or are using eye drop medications for chronic eye disease. Some Singaporeans who suffer from frequent redness, irritation or discomfort in their eyes brush off their symptoms or opt for self-care treatments. The survey found that the most common self-care treatments were the use of store-bought eye drops (48 percent) or simply limiting screen time (37 percent). However, these methods offer temporary relief from symptoms, but do not treat the primary cause of MGD – blocked meibomian glands. Often, these symptoms not only can affect daily life, but they can also be a sign of underlying chronic eye conditions such as MGD, which can be managed with early diagnosis. There is also an independently-run website – www.dryeyes.vision – that can provide more information about the disease as well as treatment options available. The website also houses a simple quiz that will help visitors better understand if they are at risk of MGD. What are the treatment options and cost? Are warm compresses and eyelid massages effective? What are some preventative methods? Warm compresses and eyelid massages are usually prescribed in combination with or prior to in-office treatments. One treatment that can be administered in the doctor’s clinic is vectored thermal pulsation, where meibomian glands function is improved by liquifying the gland contents, and gently and simultaneously evacuating the liquified contents out of the glands. In order to prevent developing MGD, daily eyelid hygiene, Omega-3 supplements,as well as overall eye health are key. Always listen to what your eyes are telling you and if you sense anything wrong, consult your eye care professional who will be best placed to advise treatment options and cost.